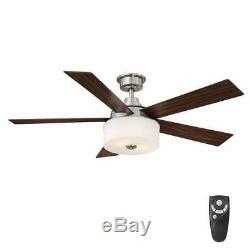 Indoor Brushed Nickel Ceiling Fan with Light Kit and Remote Control. The Home Decorators Collection Lindbrook 52 in. Brushed Nickel Ceiling Fan has a trendy drum style light kit that comes with two 13-watt medium base CFL bulbs, (you can use up to a 60-watt medium base light bulb in either incandescent, halogen or LED). The reversible blades are featured in a dark walnut and a distressed gray finish, so you will have two completely different looks within one fan for greater versatility in decor. This stylish fan also comes with a handheld remote control that separately controls both light and speed, battery included. 3-speed reversible control for maximum year-round comfort and savings. Five reversible dark walnut/distressed gray blades. Drum style light kit with frosted glass. Uses two 13-watt CFL bulbs, included. Handheld remote control, battery included. Overall fan height with 4.5 in. We stand behind every item we sell and. We try our best to make online shopping easier and safer for you. Packaging material or something equivalent. THANKS FOR SHOPPING WITH US! The item "Lindbrook 52 in. Indoor Brushed Nickel Ceiling Fan with Light Kit and Remote" is in sale since Thursday, April 26, 2018. This item is in the category "Home & Garden\Lamps, Lighting & Ceiling Fans\Ceiling Fans". The seller is "toroshomegoods" and is located in Dallas, Texas. This item can be shipped to United States, Canada, United Kingdom, Denmark, Romania, Slovakia, Bulgaria, Czech republic, Finland, Hungary, Latvia, Lithuania, Malta, Estonia, Australia, Greece, Portugal, Cyprus, Slovenia, Japan, Sweden, South Korea, Taiwan, Thailand, Belgium, France, Hong Kong, Ireland, Netherlands, Poland, Spain, Italy, Germany, Austria, Bahamas, Israel, Mexico, New Zealand, Philippines, Singapore, Switzerland, Norway, Saudi arabia, United arab emirates, Qatar, Kuwait, Bahrain, Croatia, Malaysia, Brazil, Chile, Colombia, Costa rica, Dominican republic, Panama, Viet nam.